After seeing many inaccurate shipping how-to guides, we decided it was time to create a single guide that covers how to ship eggs, chicks, and juveniles/adults as well as USPS policies, laws regarding shipping, and more! There are many right, and even more wrong, ways to ship chicks. We will discuss our opinion on the best and worst methods we have seen within the poultry business. One valuable piece of information many do not know is that USPS does not require a specific box in which to ship chicks. Many hatcheries and shippers have developed some different styles over the years. The box you see above is a perfect example of what not to use. The box you see on the left from a national hatchery is more what you should use or expect to see if you purchase chicks. An essential item you need to be able to ship and receive chicks safely is common sense. Read this guide and refer to it when making decisions about shipping. Many factors come into shipping, including but not limited to weather, travel delays, natural disasters, accidents, USPS error, and holidays. All of these need to be taken into account. We have found the best day to ship is always on Tuesday. Try at all times to avoid shipping around the holidays—mail can, and will, be delayed for many days beyond estimation. Remember: you are dealing with live animals. USPS was not devised to ship live animals—their primary goal is to move bulk mail as quickly as possible using automated machinery to get your item from point A to B in as little time as possible. These machines do not slow down for live animals in the box. The box goes through numerous drops, automated systems, conveyor belts, and various forms of transportation, before reaching its final destination. This tumultuous journey is why it is crucial to pack accordingly. Always verify your box has adequate warmth—is a heat pack needed? 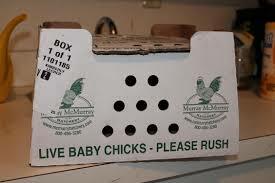 Ensure you have enough babies in the box because the more the box moves, the more they get rattled around in shipment, and the more chicks, the less space there is for them to jostle around. Monitor the weather in the city where the chicks are shipping from and to. Is it going to be too hot or too cold to ship? Many hatcheries send chicks to their death each year when a simple check of the weather could easily avoid such a problem. Do not think of profit over life. If you are ever in doubt—wait—do not ship. Be a responsible shipper—not a careless one. When shipping anything, it’s important to remember that USPS is not the only company handling your mail. USPS does not own any planes. Most mail will get handed off to FedEx to fly from near you, to near its destination. Why is this important? Because while your mail is in the hands of FedEx, it is not trackable. You will find, in most cases, a couple of scans at shipment. The first scan is out of your local sorting office. At this point, it is handed over to FedEx and then moved to its destination. Then you’ll get another scan when FedEx hands the shipment back to USPS. In our example on the left-hand side, after the item is scanned in Ybor City, the next scan ‘In transit to next facility’ is when the package would be in the hands of FedEx. It is then handed back to USPS in Grand Rapids, and regular scans would continue. What if you don’t see any scans? Well, mistakes can happen which means the item won’t be ‘tracked’ or scanned again until handed back to USPS. So, if the item gets ‘missed’ when placed into a bin, or it gets put into the wrong container, it won’t get scanned again until individually handled. 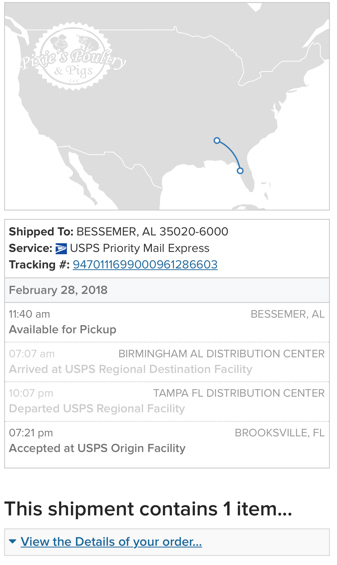 In the example to your right, you will see a Priority Mail Express shipment that was shipped from us here at Pixies Poultry & Pigs to a customer in Bessemer, Alabama. The initial scan shows acceptance as late in the day as 7:21 p.m.—Why? Because we have made contact with our USPS office at Tampa airport. They will accept business mail for shipping up to 8 p.m. This means less travel time for the birds, no time stuck in a hot truck in Florida, and less time being bashed around in the hands of USPS. We here at Pixies Poultry & Pigs go out of our way to get your birds to the airport later in the day, and onto a flight, so they can get to you as quickly as possible. This particular shipment was only going a small distance, but as you can see, it was less than 16 hours from drop-off to delivery! A little-known fact: if you use the USPS website to print your shipping labels, not only will you receive a discount, but the ‘hold for pickup’ option is available, and the address for the closest USPS office to the recipient is automatically on the label! I have never heard USPS claim they couldn’t find their own office when delivering mail so it would be difficult for them to lose the package. As you can see from the example to the left, this label was printed using USPS online shipping methods. The wording ‘HOLD FOR PICKUP’ is clearly on the label, and the printed address would be the local post office. Of course, you can go and stand in a long line at your local post office, waste two hours of your day, get to the front of the line and fill in all the labels by hand and pay full price, or you can do it all online and save time, and, in some cases, not even type out anything! Did you receive your payment through PayPal? If so, just log into your PayPal account, find the payment received, and ship from there. Print the label, stick it to the box, and done! Alternatively, you can go onto USPS.com and then use the click-and-ship option. 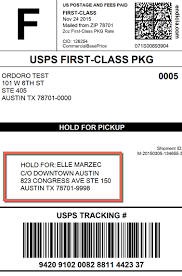 If you do print your label online, it is essential the post office scans the package. You can ship chicks using two methods: Priority Mail and Priority Mail Express. Now, before anyone gets upset and complains, it is perfectly acceptable under USPS terms and conditions to ship day-old chicks using Priority Mail. The delivery timescale guarantee of attempting delivery within three days is the same—no matter which method you use when shipping day-old chicks. Priority Mail delivery generally takes one to three days. The label printed out and given to you is an expected delivery timescale—it is not a guarantee, and should they get lost or arrive late, you will usually not receive any refund. Priority Mail is automatically insured for $50. Priority Mail Express takes one to two days. The label printed out and given to you will show a ‘guaranteed’ delivery timescale; however, you are shipping live animals, and this timescale does not apply to you. The guaranteed timeline is to attempt delivery within three days. Priority Mail Express is automatically insured for $100. There are some laws that are in place regarding shipping of poultry. The main rule of thumb is that any poultry that crosses state lines requires some form of paperwork for it to be ‘legal.’ Now, I am sure you, like us, are fully aware that people ship against various rules or the law. Just because they do doesn’t mean you should. NPIP—National Poultry Improvement Plan is a program that was put in place to allow national traceability should any illness or disease occur. It is important to remember that NPIP does not guarantee the seller is clean from all infections. Many diseases could cause illness in a flock, and unfortunately, NPIP only tests for a handful. However, it is a basic program that allows for traceability and should a flock be sick, and it will enable the State/Federal officials to go through all paperwork to be able to trace any people to which a possibly infected flock was sold. Over the years, Clemson University has put together some excellent pages and downloads of information. Here are a couple of snippets shown here. You can download the Federal Intrastate Movement Traceability Rule from the Clemson website. Whilst it talks about South Carolina, the university location, the Federal Law covers all states. NPIP is a basic program with minimum requirements in all states, and it’s important to know that many states add additional rules to its program depending on outside factors, costs involved, etc. These can range from further testing, more stringent rules, etc. and it’s important to contact your own state office before shipping. Many states now use the online facility, Poultry Improvement. This site contains a ton of up-to-date information that relates to each state. It also allows you to stay current with any changes as well as complete and print your very own VS9-3 NPIP form for shipping. Once you have become an NPIP participant through your state, (contact information is on the above website), you can then use the online from – right-hand side NPIP Database. Essentially, pretty much anything can go wrong. That’s why it is helpful to know, from both a buying and selling perspective, what could happen. It is also important to remember that you are buying a live animal. You’re not buying a boxed item from Amazon or a pair of easily-replaceable sneakers from China. You’re relying on many factors to get chicks from point A to B. If you follow the tips and tricks we provided in this guide, you will give your birds their best bet.